We've found several that we really, really like. Today I'm going to tell you about 5 of our new favorites. Big Bad Breakfast is the only one on the list today that isn't exclusively in Birmingham. They have one other location in Oxford, MS. I think it counts as local. 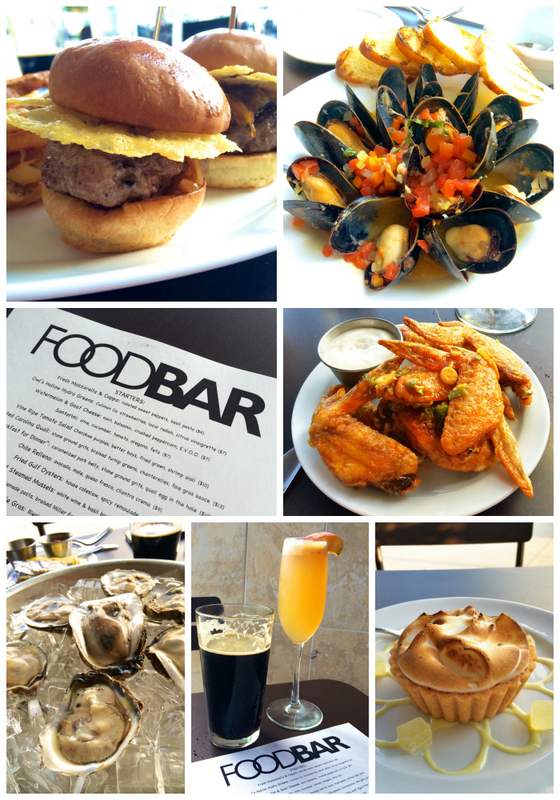 We had the opportunity to check out FoodBar last week. It is located in a shopping center, behind The Summit, in Cahaba Heights. They recently launched a new Happy Hour menu on Tuesday and Wednesday. They have various $5 food and drink specials. We started with a couple of the $5 drink specials. Chicken Legs got a beer, and I got the Chilton County Peach Bellini. For starters we got the $5 Sweet and Sour Wings and the Steamed Muscles. The wings were spicy and super delicious. I would definitely get them again. The Steamed Mussels were served in a white wine and basil broth. O-M-G! I could seriously drink that broth right out of the bowl. It was crazy good! For our entrees, we got an order of Oysters and the Sliders. 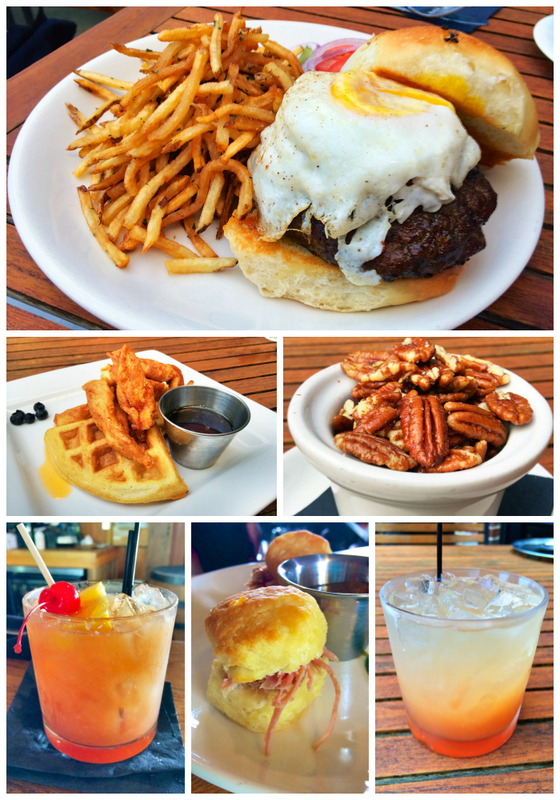 The sliders were a new addition to the Happy Hour menu and were only $5. They were so good. I LOVED the parmesan crisp on top. I am totally doing that the next time we make burgers. The oysters were fresh and delicious. Chicken Legs gave them two thumbs up. We couldn't leave without checking out dessert. We split the Individual Lemon Meringue Pie. It had a citrus shortbread crumb crust, toasted meringue, and lemon drops on the side. It was lick your plate delicious. We are already planning our next trip back! Dram is probably our new favorite. We can't get enough of the amazing hand made cocktails. My favorite drink is the Frankfurt Fizz. It's Jacob’s Ghost white whiskey, OJ, house sours, house grenadine, and topped with champagne. My second favorite drink is the Dram Sour. Jack Daniel’s, OJ, lemon juice, house orange bitters, and house grenadine. They use fresh squeezed OJ and lemon juice. It makes all the difference. 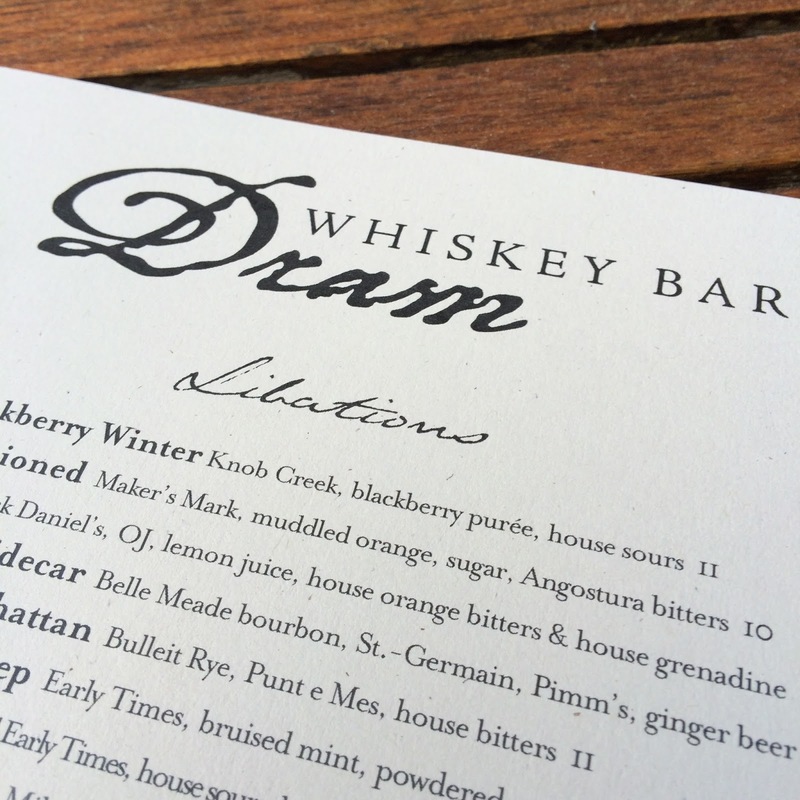 In addition to the incredible cocktails, Dram had some of the best food around. Chicken Legs loves to order the Hot Nuts. They are really good! Their burgers are out of this world. And those fries! Make sure to get the Rosemary Ketchup and a side of Henry Bain's sauce. I am also a huge fan of their Hot Brown (not pictured). It is SO creamy and yummy! If you don't want something as filling to eat, they also have some small plates to snack on. I love the Nashville Hot Chicken and Waffles and the Country Ham Sliders. 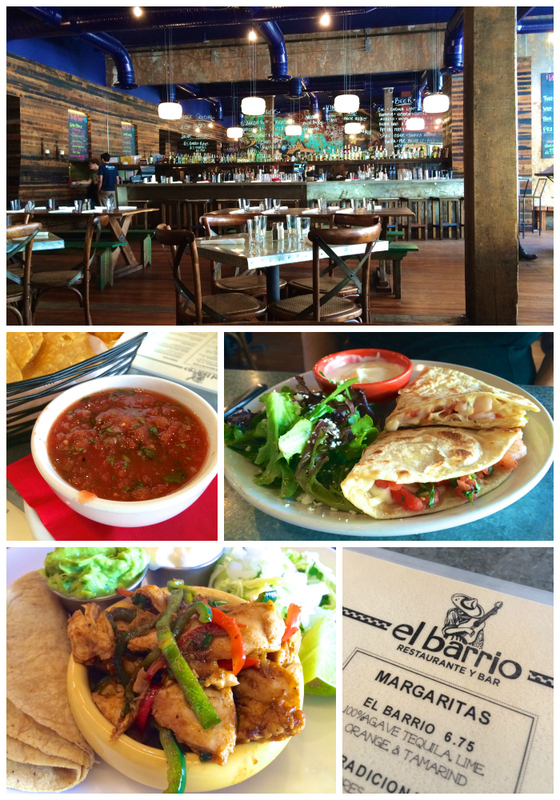 I've heard a lot about El Barrio lately. Our bartender at Dram said it was one of his favorite places to go. I was excited to finally check it out. The interior is really cool. I love all the wood. You have to pay for the chips and salsa, but you get free refills. The salsa was one of the best I've had. It was so fresh and delicious. I wanted to just drink it! El Barrio has SO many delicious choices. I finally decided on the Chicken Tacos. They were crazy good! I loved that I could assemble them myself. My friend got the Shrimp Quesadilla. It looked amazing! Chicken Legs and I are planning on going for dinner very soon. We have to check out the margaritas! I've been waiting on BBB to open ever since my blogging friend, Jennifer at Bake or Break, told me about it. She said it was the only place she missed in the south. 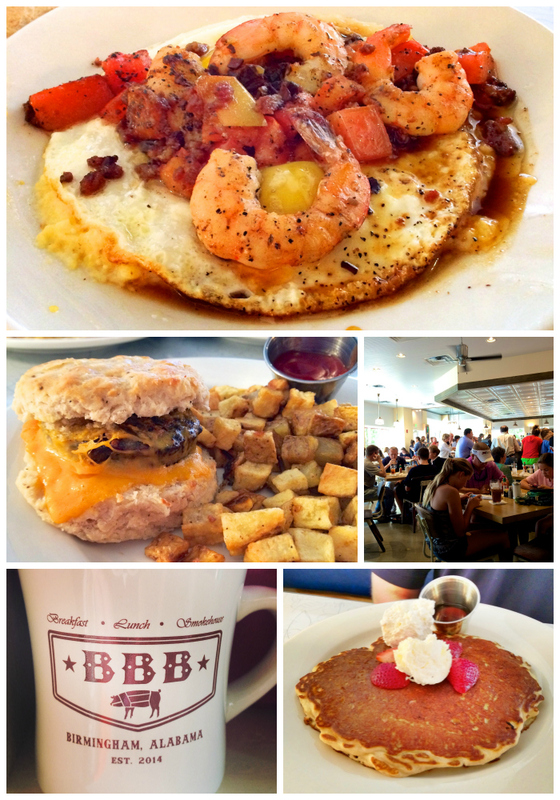 Big Bad Breakfast is owned by James Beard Award winning chef, John Currence. I knew I was in for a treat. We went the first week they opened, and it was surprisingly smooth. Everything was great, which is sometimes unusual for a new restaurant. We had to wait a bit, but that was to be expected at a new place. Chicken Legs got the Shrimp and Grits and a pancake. The Shrimp and Grits were amazing! SO good. The pancakes were great. They weren't overly sweet. Ask for extra syrup. I got the biscuit with sausage and cheese. It was served with home fries. YUM! I loved it all. The biscuit wasn't a plain old biscuit. It was so tender and had great flavor. Those home fries were delicious. I am getting bacon the next time. It looked amazing in the case. You can buy the sausage and bacon by the pound at the front counter. Basil is next door to one of my all-time favorite Bham joints (Saw's Juke Joint) in Crestline Village. We went for dinner and sat outside on the patio. We started the night with some wings. They have tons of flavor options. We went basic and got the "hot" wings. They were crispy and hot. I went back for lunch and got the Carolina BBQ Wings and they were also super delicious! We want to go back and do a flavor tasting of 3 or 4 types of wings. The pizza was great! It is one of my favorites in town. We got a Sausage and Pepperoni pizza. YUM! The crust, the sauce, the cheese - it was all good. I love the way the Italian sausage curled up as it baked. Another couple we were with got the Margherita Pizza. It was loaded with tomatoes, basil, mozzarella and a balsamic glaze. We were absolutely stuffed when we left. 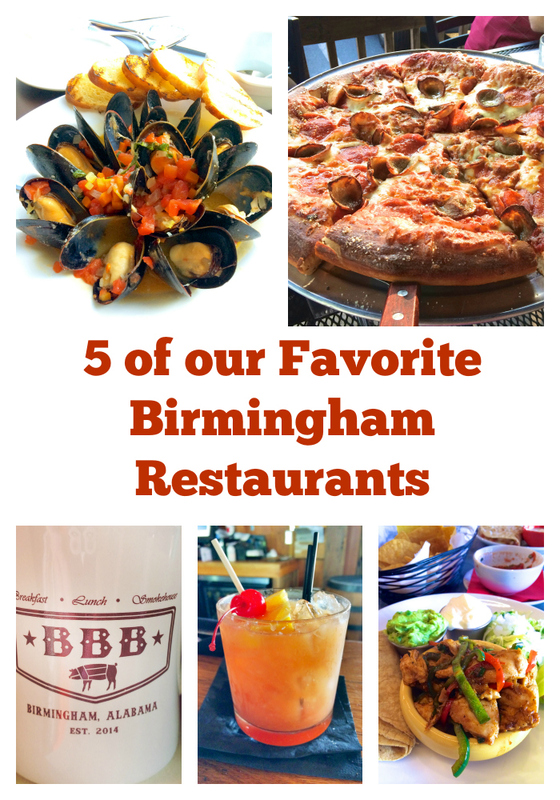 What are your favorite Birmingham restaurants? What is your "must-try" place? I love your reviews of local Birmingham restaurants. I want to try all of these soon! I live near Big Bad Breakfast and have been meaning to check it out. I am definitely going today! I have also heard good things about Paramount. Have you been there yet? A friend mentioned Paramount. Haven't been there yet. If you get a chance, try Satterfield's in Cahaba. It's always our special occasion dinner spot. Plus, our friend just became sous chef and makes all of their gorgeous desserts. I don't live there but my mom's family is from Birmingham, so I will post this on my Facebook page. I can't believe I've never tried ANY of these! Definitely putting on my list! Bellini's (our son said he liked it better than Gianmarco's)& Bistro Pro Vare, the Culinary Restaurant of Jefferson State in North Shelby County (find them on Facebook for schedule). 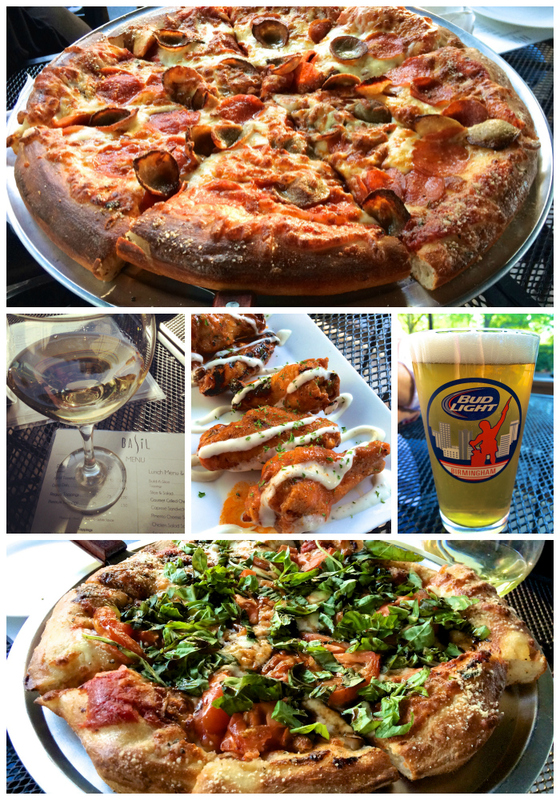 We like to go to Bellini's too (right next to our house) - we still think Gianmarco's is better though. I need to check out Bistro Pro Vare. I've heard great things about it! I'm so glad you liked Big Bad Breakfast! Seeing those photos this morning is making my bowl of yogurt and granola look pretty sad. I love all the ones you've chosen except I haven't heard of Big Bad Breakfast! Have you ever been to Iguana Grill for Mexican on Lorna Rd. in Hoover? I just love the decor/atmosphere in there and same with Veranda on Highland...I just about cried when Leonardo's left Rocky Ridge in Vestavia,I heard they reopened on 280 but that it wasn't as good~ can't wait to see what you recommend next! Baja Burger in Hoover, Bella near Greystone, Slice in Crestwood, and Brick and Tin downtown are all really good! Carrigan's on Morris Avenue is definitely worth checking out if you haven't been yet. It is a bar, so you don't have a ton of food options to choose from. But their oxtail chili fries and black eyed pea felafel are awesome. I haven't tried their cocktails, but they have a lot of local craft beers on tap.